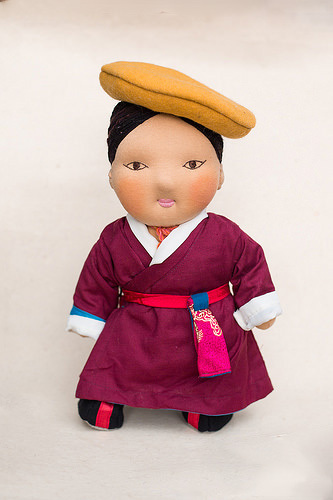 Thinley comes from Kyirong, the Southern region of Tibet, near the Nepali border. Under his chic distinctive yellow hat his long hair is tied back in a plait, interwoven with red silky thread. He wears a white shirt and a long, typically maroon, chupa coat which is held together with a red silken belt. He attaches a silken pouch to his belt, used to store essentials for a farmer’s day out and he wears comfortable felt boots.